LIKE pilgrims to some holy land, but tattooed and on two wheels, thousands of adventure motorcycling enthusiasts converge in Sturgis, South Dakota, USA every year to be part of one of the country’s largest and longest-running gatherings of bikers. Many of them ride for days, enduring miles of blistering sun, bouts of rain and the occasional mouthful of bugs before arriving in a cloud of dust at the Sturgis Motorcycle Rally. Needless to say, the major star of the rally is a brand that has a cult following as massive as that of Apple, Starbucks and even Superman – Harley-Davidson. Harley-Davidson is the prototypical cult brand professors refer to in business schools everywhere. That’s because its one of the earlier companies to truly develop a ‘lifestyle‘ brand. The wide open road and the thunderous roar of a V-Twin engine make Harley Davidson stand out as the ultimate motorcycle cult brand. Like a man who smokes Marlboro, a man was defined by his Harley. The Harley spoke to the freedom of the open road, the defiance against society and the need to belong, but not belong. With any consumer phenomenon that has a larger than life feel associated with it, there is more often than not a strong element of media that enables such a perception. The aura of a man (or in recent times woman) on a motorcycle has largely been fueled by Hollywood classics and celebrities who are biking enthusiasts. Who can forget Arnold Schwarzenegger riding a Harley-Davidson FLSTF â€œFat Boyâ€ in Terminator 2 – Judgement Day chasing down T-1000 in a tow truck? Or for that matter Carrie Annie Moss on her Ducati 960 in Matrix Reloaded getting the key maker to safety. 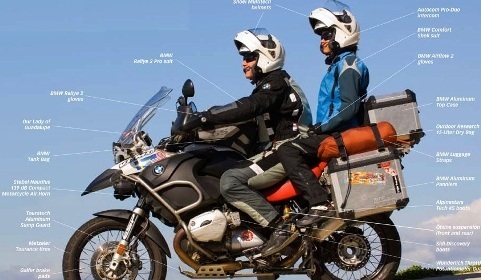 Similar to Hollywood, India’s very own world of entertainment has its own motorcycle crazy celebrities who play a role in promoting adventure motorcycling. Bollywood and Cricket stars such as John Abraham, M.S Dhoni and Sanjay Dutt love their bikes and are frequently seen riding them in their movies and television commercials. Much like many other developing markets, India too has its own stable of motorcycles with brands such as Hero Honda and Royal Enfield having a history and culture that spans generations. The latter in particular can almost be deemed as the “Harley Davidson of India” as it truly has a number of similarities with the iconic global brand. The oldest motorcycle company in existence, Royal Enfield made its first motorcycle in 1901 (while Harley made its first in 1905). A division of Eicher Motors Limited, it has been a pioneer of powerful four stroke technology since 1955 in India. With its manufacturing base in Chennai, India, the company offers a variety of models catering to the needs of the traditional segments, the enthusiasts, the leisure bikers and the urban youth. Royal Enfieldâ€™s domestic lineâ€up includes the Bullet 350, Bullet Electra, Classic 350, Classic 500, Classic Chrome, Desert Storm and the Thunderbird Twinspark. One of the key reasons behind Harley Davidson’s success, cult like following and presence in almost every Brand Management 101 course on earth is due to its the “Harley Owners Group” grassroots initiative the brand fired up in the mid-1980s. Membership started with dealership promotions and spread by word-of-mouth. People had groups they could meet up with and develop bonds â€” all based around the Harley brand. It became more than an echo chamber because these people would go out and recruit more Harley enthusiasts to join. In a similar vein Royal Enfield also organizes and supports many adventure motorcycling activities, events and rides across the country. The most prominent amongst these is the Rider Mania â€“ an annual gathering of Royal Enfield riders from all over the country and the Himalayan Odyssey, the largest motorcycle ride over some of the toughest roads and highest mountain passes in the region of Himachal and Ladakh. Taking on the highest motor-able road in the world, reaching at altitude of over 18,000 feet with my Enfield is the most satisfying moment of my lifetime. Getting to know and riding along so many riders from different part of the countries, sharing experiences, and singing for the common thump is the greatest part of the journey. I will never forget the chills which ran through my spine due to the subzero temperatures and the feeling of calmness and accomplishment I experienced on viewing the magnificence of the Himalayas. Danger, Exploration, Friendships, Community Support, the attention of media and endorsement by celebrities, all of this pretty much explains the rustic charm of men and women who ride heavy duty motorcycles. One thing is for sure, that the hobby is not meant for the feeble hearted or those with lack of adrenaline.